This is my favorite card this year. I just love the soft vintage look this card has! I used the Cuttlebug Embossing folder to create the background on some Sweet Leaf cardstock and then used a brayer to apply Chocolate ink on top to bring out the emobssing and distress the background. 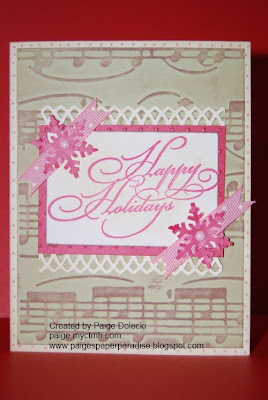 I added our Happy Holidays greeting from the Gracious Greeting set in Tulip with a bit of Jingle paper pack to frame. The snowflakes are also punched (Martha Stewart) from the polka dot Jingle paper and a couple of strips from my new Martha Stewart edge punch were added in Colonial White to help frame the whole thing. I aslo used some Bamboo ink to distress the Colonial White pieces.